… and it’s all perfectly legal! Yes, that’s right – there’s no catch. So, what is Linux and what can it do for us? Linux is a replacement for Windows. Though you can set up your computer so that, when you start it, you can choose between Linux and Windows. Computers are generally sold with Windows installed. This is an OEM version of Windows which is cut price compared to buying it separately. They make their money through the adverts that get thrown at you, and by having time limited versions of Anti-Virus and Firewall software included – so people pay for Norton or MacAfee, both of which are rather better at slowing your computer down than stopping viruses. If you must have Windows delete this rubbish and download free versions of Avast anti-virus and Zone Alarm firewall. Here, I’m saving you money already! But where it can save you real cash is simple – you might have a computer where Windows is totally messed up, but there’s nothing at all wrong with the hardware. Why buy another when you can install Linux? What? I hear you cry. Yes. Windows is only easy to install because it’s already on your computer. Take an empty computer and try to install Windows from scratch. Linux comes in a number of distributions, aimed at different users, and those designed for beginners are actually easier to install than Windows. For a start, Linux will already have drivers for the vast majority of Hardware that you can throw at it. So no swapping other disks in and out. Viruses are designed for Windows computers because there are so many more of them. But even if they decided to write viruses for Linux, they wouldn’t get very far. I’m not saying it’s impossible, but the inbuilt security of Linux means that, in order to get a virus on your computer, you’d have to be extremely co-operative to the point of stupidity. 4. Free Software means that the best stuff can be installed as standard. Most people who buy a computer fall into two categories. Gamers and non-gamers. If you’re a gamer, you may be better off with Windows. This is because programs have to be compiled for Windows or Linux. Generally speaking, the same executable file will not run on both. Though there are programs, such as WINE, which may help you run SOME Windows programs under Linux. You can set up your computer so you can boot into either, as I said earlier. So why not have Windows for gaming, and Linux for secure internet browsing? Internet Browsing: Firefox/Google Chrome/Pale Moon/Mozilla – All available for Windows, too. If you’re still using Internet Explorer, try these now under Windows. This will give you an insight as to what free software is capable of. All are superior and more secure than Internet Explorer. Also, not available for Windows, Konqueror and ReKonq. Personal Messaging: Pidgin/Kopete can handle all your chats, (Facebook, Live/Outlook, Yahoo, GoogleTalk, AIM, ICQ, etc). You can also try Pidgin in Windows. Skype is also available for Linux. As is the add-on to enable Voice-Video talk in Google Hangouts. Office Suite/Wordprocessing: Libre Office handles Microsoft Office formats and is Free. It’s also available on Windows so you can see what it can do. Remembering that Libre Office is free, and MS Office costs a small fortune, in my opinion, the Wordprocessor in Libre Office is actually better than MS Office. If you don’t want a whole office suite, but just a Word Processor on its own, try Abiword instead. If you want to do precise page layouts (Desk Top Publishing), try Scribus. Again it’s something you can test out on Windows. 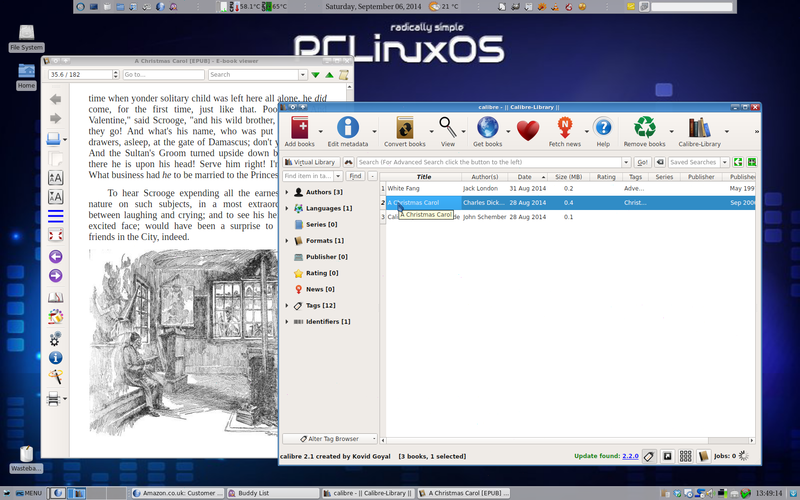 A screenshot from my computer – Clementine, Pidgin and PaleMoon running. Of course there’s more. But how do you get to the programs? A screenshot with a simple Start Menu. Above is the “simple” Menu, and below the more fancy one. You can have whichever you prefer! Note that, along the top of the screen, I’ve got shortcuts to programs I use most, so I rarely use the menu anyway! A more modern style menu. Note the bit at the top of the menu box where you can start typing the name of a program if you can’t find it. 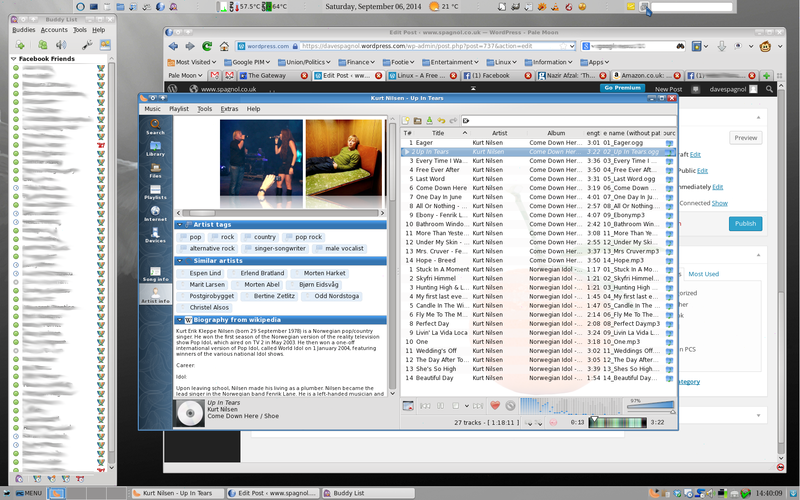 In this final screenshot, I am running a program called Calibre (you can get this for Windows too). It turns your computer into an e-book reader, but also links to your actual e-book reader, and transfers your books onto it, giving you more choice about book formats etc. But more to the point, look at the tops of the windows. Is Linux really as complex as you may have heard? No it’s not! You can see the buttons you use to Minimise, Maximise and Close at the top right. Once installed, it’s not really that much different to use, but remember: it’s virus proof. It doesn’t install and run loads of extra stuff behind your back. It runs more quickly or on a slower computer. You don’t get adverts tossed at you. You get nice clean menus arranged logically. Look at the Window Decorations at the top of each window. The next paragraph is more technical than the others. What you need to know is that adding, removing, and updating software is handled through the Linux Distribution, not the creators of each individual program. You may skip to section 8 if you wish. 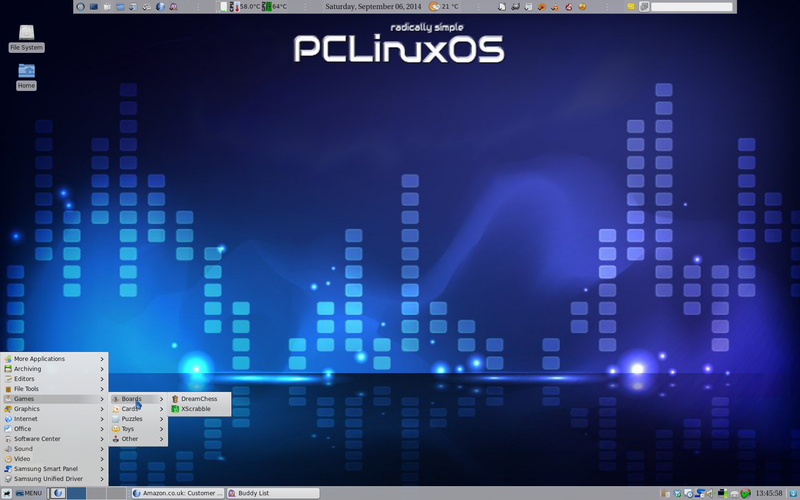 One of the wonderful things about Software being Free, is that the people who create a distribution of Linux (“distro”), such as PCLinuxOS, can take the source code of a program, make a few tweaks to ensure it runs properly on the distro, and package it at an online repository (“repo”). 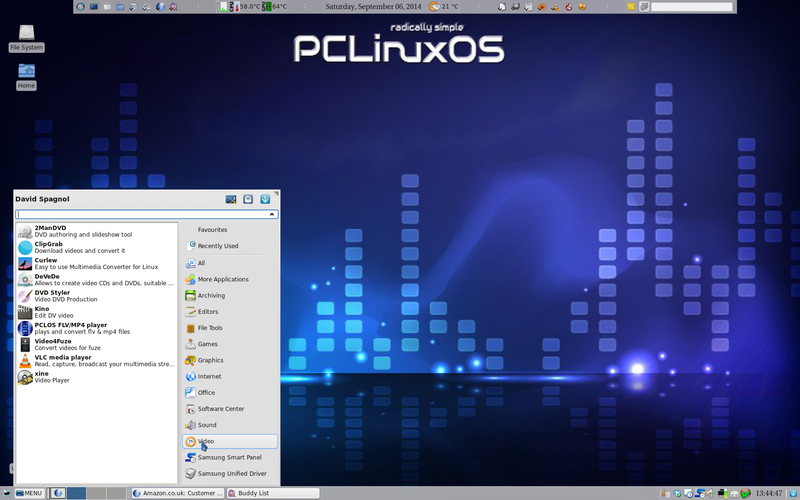 PCLinuxOS uses a program called Synaptic, to connect to the “repo”, list what’s available, and download and install any program you select from the list. It also means that if a “library program”, (like a DLL file in Windows for example,) needs updating, every program that depends on that library can be tweaked to ensure that they continue to work. I can remember “DLL Hell” in Windows, where one program installed a different version of a DLL file over one provided with another program, and the older program stopped working. This is not a problem in Linux, provided the people doing the packaging are on the ball. You can see how this can affect a commercial program, with companies and individuals guarding their secrets! Sadly, there is the odd printer and scanner that doesn’t like Linux. Most do, including all Hewlett Packards, nearly all Epsons, so I tend to check before buying hardware. There is good information on the internet about what does work. The upside to that, is that you can try it out from a disc or memory stick, without installing it, without it costing you anything, and check your hardware will work. So it costs you nothing to try. Visit PCLinuxOS for more information.